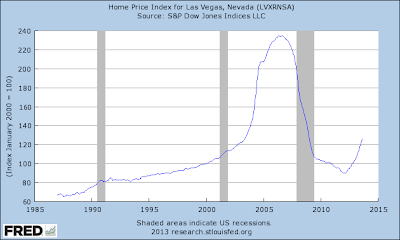 Las Vegas has been the poster child for the real estate bubble in the United States. The chart below shows the epic rise in prices during the first bubble, the first collapse, and the second bubble that began to build steam early last year. 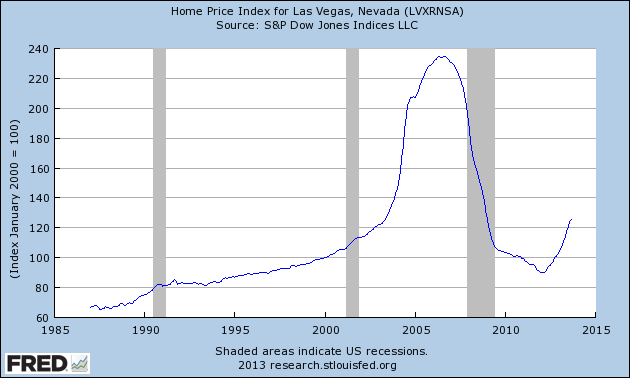 I discussed the economic fundamentals behind the rise in Las Vegas home prices a few months ago (there are none) in Behind The Curtain Of The Artificial U.S. Residential Home Market. This week we received a real time update on the Las Vegas market from Mark Hanson, who is tracking the data in real time. Las Vegas housing demand has crashed. "Crash"...there is no other word to use. This is not hyperbole. "Crashed" is absolutely the appropriate word to use here given sales are suddenly the weakest levels since Armageddon 2009. I mean come on...sales at the same pace as when the stock market was in the midst of one of the greatest plunges in history speaks loudly...at least to me. Volume precedes price. Supply is surging in Vegas with "months-supply" back to nearly 7 months (over 7 for condos), and at 2010/11 levels. There certainly is NO LACK OF SUPPLY in this market. And ponder about this for a minute...and apply it to all these other "investor-centric" regions around the nation. That is, in Vegas there are 10s of thousands of single-family houses being readied for rent by new-era "investors". This flood of freshly rehabbed "for rent" supply will competes at some level with resale and builder "for sale" supply. Even if it competes at a factor of .4, then Las Vegas "normalized" month's supply could right now be back to a year. Lastly, houses are as expensive on a monthly payment basis -- and relative to the income needed to qualify for a loan -- then they were at the peak of the bubble in 2006. But, this is a fact masked over for the past year by the plethora of all-cash buyers who are not governed by employment, income and safe & sound mortgage lending requirements. Like Sacramento, Phoenix, regions in the Inland Empire, and a dozen other "hot" real estate markets around the nation -- that, "not"-coincidentally are the regions in which private and new-era "investors" swarmed with cash regularly paying 10% to 20% over appraised value / list price using flawed cap rate models as a guide -- when the stimulus go-go juice ran out this market hit a literal "brick wall" the size of 2007. With house as expensive on a monthly payment basis than they were in 2007, when this market turns back towards "organic" being the incremental demand driver (people that can only buy as much house as their job, earnings, and mortgage qualifications dictate) serious double-digit percent points of house price downside will occur. That's in the process of happening now. The next year in Vegas could easily bring a 50% retracement of the past two years historic annualized gains, which to all the investor models predicting 10% appreciation in perpetuity, will feel like a crash.